At least six Pakistani soldiers were killed and several of their bunkers destroyed when the Indian forces resorted to retaliatory artillery fire on Pakistani positions across the LoC at the Noorpur, Shahpur, Khari Karmara and Sawjian areas of the Poonch sector throughout last night. A defence spokesman said today that Pakistani troops from 10 Corps opened mortar firing on forward Indian army formations and adjoining villages and continued to rain 82 MM mortar shells, inviting retaliation from the Indian troops. In reply, the troops manning the forward areas unleashed fire from similar calibre weapons and the heavy cross-border firing continued for some time in which two Pakistani regulars were killed. Incensed at the heavy Indian retaliation, the Pakistani fired from 105 MM field guns in a bid to pin down the Indian troops. 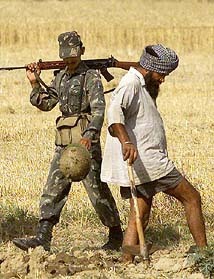 But here again, troops gave a befitting reply, silencing Pakistani guns after sometime. But in this retaliatory firing three more regulars were reportedly killed and five of their bunkers destroyed. Elsewhere along the LoC, the Indian and Pakistani forces are locked in a fierce mortar duel at the Pallanwala and Pargwal areas of the Akhnoor sector since late last night, the spokesman said. Four civilians were reported to be killed and six sustained injuries, three of them critically, in the fierce cross-border firing. One Indian soldier and five civilians were killed and 10 others wounded when several villages in the Pallanwala area of Akhnoor, Mendhar, Nowshehra and Poonch were pounded by mortar shells fired by the Pakistani troops since late last evening. Defence Ministry officials said in the heavy shelling, one soldier and five civilians were killed and six others wounded. Among the killed were three children. Four other civilians were wounded in the Pakistani shelling in Digwar and Balnoi villages of the Poonch sector where the Pakistani forces resorted to heavy shelling and firing since this morning. While the Pakistani troops used mortar and artillery guns, besides heavy calibre weapons to strike at Indian posts and villages in Poonch, Nowshehra and Rajouri, they carried out firing on the villages in the R.S. Pora and Samba sectors with small arms. The USA today said it wanted General Pervez Musharraf to fulfil his commitment to end cross-border terrorism in Jammu and Kashmir. Shell-shocked residents of this border village woke up to the sound of mortar shells, fired by Pakistan on Sunday morning. Inder Dass, saw smoke billowing from the compound of his residence. Nothing was visible for a moment. Then he found his two buffalos and a calf lying seriously injured. This is for the first time that Pakistani shells have landed in this village which is more than 1 km from the border. 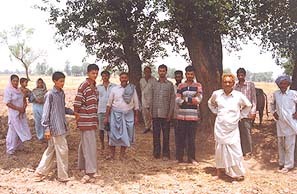 Fear is visible in the eyes of the residents of this village even two days after the incident. There has been a fresh bout of migration from Bahawalpur, Kotli Jawahar and more than a dozen villages which have a common border with Pakistan and troubled Jammu and Kashmir. The villagers shifted their women-folk and children to safer places after the incident. The villagers across the Ravi and the Ujj which are connected with ‘kacha roads’ complained that despite assurance by the district administration, no vehicle was arranged by the officials after the shelling by Pakistani troops. Mr Karnail Singh, sarpanch of Bahawalpur village, Mr Sham Lal, and Mr Jarnail Singh, sarpanch and nambardar of Kotli Jawahar village, respectively, said the villagers had been living under constant fear due to firing by Pakistan. During a visit to the border villages like Malakpur, Kiri, Kathlore, Bahadurpur, Gillpur and Udhipur Aima etc, this correspondent found the residents discussing the firing by Pakistan in small groups. A shopkeeper of Bamyal village Mr Rampal Gupta said the Army had stepped up its activities in the border villages, especially after the firing by Pakistan. Residents of Bahawalpur village, Mr Ramesh Singh, Mr Joginder Singh and Mr Surjit Kumar told this correspondent that most of the villagers did not have any source of income as they could not cultivate their land due to the Army build-up. They said the district administration should come forward to help them at this time of crisis. It is pertinent to mention here that Pathankot is strategically a very sensitive and vulnerable area due to its important installations. Since Pathankot has contiguity with Pakistan, Jammu and Kashmir and Himachal Pradesh, the ISI-sponsored militants have been active in this area. The MiG-21 Bis fighter planes, which were grounded in the wake of the May 3 crash of an aircraft at Jalandhar, have hit the skies again on routine training duty in view of the Indo-Pak tension. IAF sources said today a majority of the aircraft in this category had resumed “flying duty” after special security checks. Some six squadrons of the MiG aircraft, fitted with R-25 engines, were withdrawn from flying duty after the Jalandhar accident in which some civilians were killed. The sources said some 50 aircraft were back on routine sorties while other planes were going through special checks.